Commercial overhead doors may be opened and closed up to 50 times in a day. They need to be reliable, durable, functional and secure. There are many types of commercial overhead doors. Each with its own unique benefits and best uses. Read on for the ultimate guide that details different types of doors so you can make the best decision to suit your needs. Sectional doors are made out horizontal panels. You can get them in two types of garage doors: galvanized steel or aluminum. They are great garage doors for your industrial warehouse, shipping dock, fire station, pole barn, or outbuilding. You can choose between manual, chain hoist or electric operation. Many offer the option of a pedestrian door. Adding a door-within-a-door is a smart choice for garages with high volume traffic or where alternate entrances are distant or do not exist. A pedestrian door is the regular size of a door which means your employees will not have to stoop to get in and out. They usually are built with an automatic closer to keep energy in and mounted to swing outward (either left or right). For controlled access, there are various locks, mechanical entry pads, exit panic bars, electric strikes with digital entry pads or card readers available. You can opt for full-view panel doors when natural daylight and clear visibility are necessary. These doors are strong and low-maintenance. They can have windows or not. Adding windows enables fresh air to circulate in your interior and allows for sunlight in otherwise dark garages. Screens will keep insects or rodents from entering your facility. Make sure to ask about energy efficiency when discussing different types of doors with a retailer. You will want to get ones with a high R-value to keep climate controlled buildings the correct temperature. You can also get non-insulated doors if you choose. Depending on your needs, you may want to opt for a heavy-duty 2″ thick door with a 24-gauge steel front. A lighter-gauge steel front will give you less of an industrial look if you are in a residential area. Sectional doors are well suited for just about anywhere and have a wide variety of industrial applications. When you want to maximize your inside square-footage and need a clean, modern look, commercial aluminum garage doors are a great solution. They are typically used in architectural situations that demand light transmission and visual access. They are excellent for car showrooms, car repair shops, service stations, car wash locations, and restaurants. Choose from several options in glazing materials, stile widths, finish options and track styles. You can choose from light, medium or heavy-duty types of garage doors for sectional aluminum doors as well. Medium-duty aluminum doors let in natural light and are sleek and polished. These types of garage doors are made from interlocking slats that coil around a drum to open and close. Galvanized steel, stainless steel or aluminum constructions are all possible. Rolling doors are perfect wherever space is limited. You will get thermal protection, low sound transmission, weather and wind protection and special security features. Some versions offer fireproof protection. A weather-seal at the bottom forms a barrier against weather, dirt, insects, and rodents. A slide bolt lock accommodates up to two padlocks for security protection. Need a repair on your door or hardware? R&S Erection of Vallejo can help. Security grilles are available in either side-folding or upward-rolling models. These are different types of doors because they are meant strictly to form a security barrier against debris and theft. The stainless steel grille provides the ability to look through the barrier when the security gate is fully closed. These doors are often seen in airports, storefronts, display cases and airports. There are commonly two types of patterns: brick or straight pattern. You can choose between manually or motor-operated models. Just like rolling sheet doors, security shutters provide theft protection for high pedestrian applications such as hospitals, pharmacies, and liquor stores. The aluminum slat curtain may be open like security grilles, or partial fenestration or perforation. There are dozens of finishes to choose from even wood grain for an aesthetic look that blends in. As the name implies, these types of commercial overhead doors offer superb fire protection. Like a roll-up door, fire-rated doors can be motor or manually operated. These doors are made from thick, heavy-duty stainless steel which makes them fire-resistant. Fire-rated doors can also block out the noise and provide insulation. An extra safety feature allows these doors to close automatically in the event of a fire. Fire-rated doors are incredibly useful and a common choice for warehouses, parking garages, distribution centers and mills. Commercial gates (sometimes called scissor gates) usually open to the side like a sliding door. Sometimes, these types of doors are designed just to swing open and shut, which is a more economical option although does require more space to open and shut. Take into consideration the time of day these would need to open and shut at your business. If there is a lot of foot traffic, this may not be your best option. Once pulled closed, they can be locked just like any other door. Constructed from thick steel makes these gates give you dependable protection, but also allows ventilation through the gate holes. When you shop for your commercial garage doors, consider the functions it will serve and the aesthetic you want. 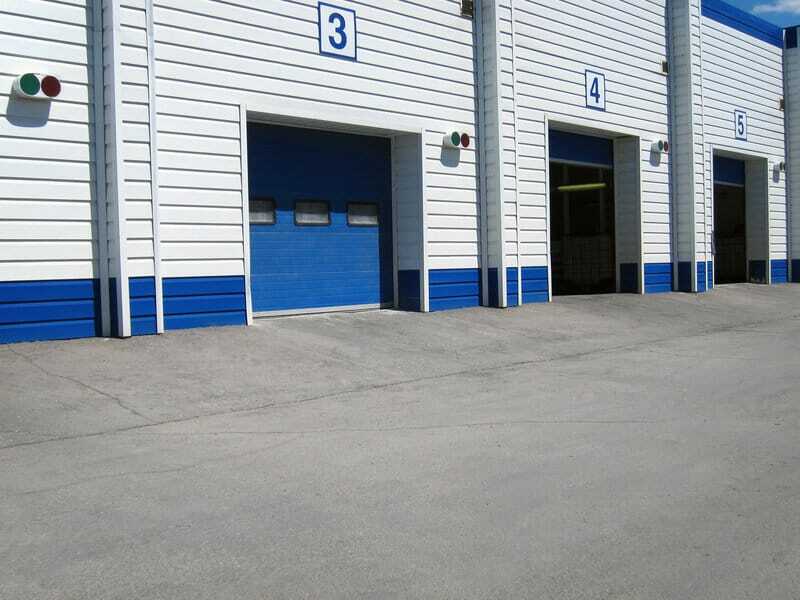 R&S is a one-stop shop for all types of commercial overhead doors. We can help find you the right option to meet your needs for your business. Get a free quote today.